1. The winner of the tote bag in my one year blogiversary giveaway is Lucy from Speckled Egg. Congratulations! I've only been reading Lucy's great blog for a few weeks (since she signed up for the ornament swap) but I'm really enjoying reading about all the wonderful stuff she makes - including making soap last week! And she is so organised she's even finished her ornaments for the swap already. I'm seriously behind, but I'm hoping to make some progress next week on my ornaments. 2. 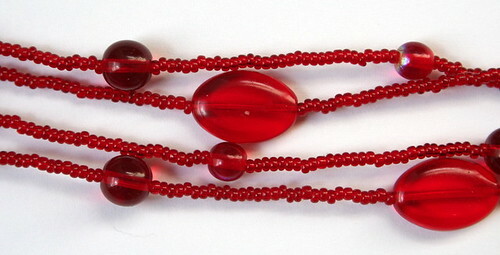 I have been wearing the wonderful red beads in the photo above almost constantly since I got them on Sunday. I received the necklace in a swap I did with the lovely Kimberley of Special K. I made her some baby shoes for her cute little boy Harper and in return I choose one of her scrummy necklaces. Thanks K, I love it! 3. The Big Schwop is happening again in Wellington on the 29th November. This is your chance to clear your wardrobe of clothes you aren't wearing and score yourself some cool new things. Spaces are limited to 300 schwoppers, so make sure you sign up on the website so you don't miss out. 4. My few days away in Melbourne were great. The wedding itself was in Torquay and I didn't get time to visit any craft places this time, though I did manage to get to Vegan Wares for some new shoes. And I discovered a cool organic cafe/deli that serves scrummy vegan food, right in the CBD - details to come in another post. Hi Louise ... I KNEW those beads were Kimberley's!! And the shoes you made for Harper are gorgeous. Which is just as well, because he's my nephew and has a duty to be splendid at all times. Ooh, and you've put me on to vegan baking - not that my boy notices as he scarfs it all down.